Pohutukawa and rata are known as New Zealand’s native Christmas tree because of the bright red blooms which decorate the trees during the Christmas season. They trigger memories of long summer days spent with friends and family in, on, around and under these magnificent trees. Pohutukawa and rata belong to the myrtle family (Myrtaceae) which is made up of about 3000 different tropical and warm temperate trees, shrubs and vines. Eucalyptus, feijoas, cloves, guavas and bottlebrushes are a few family members. 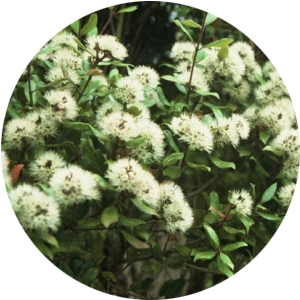 In New Zealand myrtles are represented by some of our best known plants: kanuka, manuka and some less familiar, but nevertheless significant species like swamp maire and ramarama. 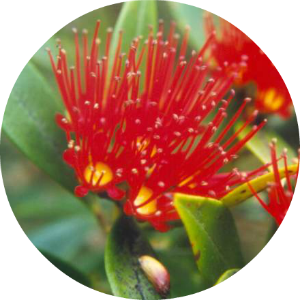 Both pohutukawa and rata belong to the genus Metrosideros, the iron hearted myrtles, a reference to their hard, very heavy, dark red heartwood. There are two native pohutukawa (mainland and Kermadec) and six species of rata vine, a shrub and three tree rata. Project Crimson concentrates on the mainland pohutukawa and the tree rata – northern, southern and Bartlett’s – as these are the most threatened by possums and people. How fast do the trees grow? Young plants grow faster than older plants. In a very fertile environment with good moisture and plenty of room, young pohutukawa grow at around 30cm per year in height and 5-10mm in diameter (thickness). Older trees gain around 10cm in height a year and 2mm in diameter. Rata grows at about half the rate of pohutukawa. 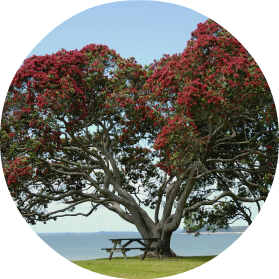 Pohutukawa can live for hundreds of years in their natural coastal environment. While it is common to see 100-year-old trees growing in home gardens, both pohutukawa and northern rata can probably live up to 1000 years. Both pohutukawa and southern rata can spread by branches that touch the ground sending out roots and forming new trees. As a result it is impossible to accurately assess the age of trees that have grown in this manner. Metrosideros is the Greek word for ironwood, which reflects the hard nature of the timber. The species name excelsa is derived from the Latin word meaning “raised” or “exalted”. A former name, Metrosideros tomentosa, described the felt of white hairs (tomentum in Latin) which covers young stems, buds and undersides of the leaves. Found throughout the North Island, particularly north of New Plymouth and Gisborne. 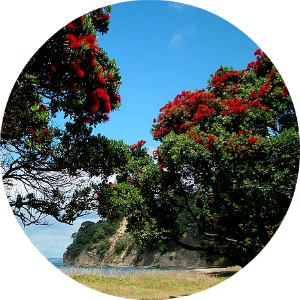 Pohutukawa grows best in warm, drier areas close to the sea. Grows to 20 metres high by 35 metres wide. Found from Hokitika northwards. It usually begins life as an epiphyte (perching plant) high in the forest’s canopy. The largest trees are found in warm moist areas such as northwest Nelson and Northland. Northern rata grows from the coast to a maximum of 900 metres above sea level. One of New Zealand’s tallest flowering trees. Grows to 25 metre or more high with a trunk up to 2.5 metres in diameter. Grows throughout New Zealand, particularly along the South Island’s West Coast. Best suited to South Island and cooler, high rainfall regions. Occurs from sea level to 760 metres above. A forest tree, it is found on rocky slopes and in river gorges from coast to mountain in the south and west of the South Island. It is restricted in the North Island to isolated stands or single trees on elevated cool damp sites. Grows to 15 metre high – sometimes more – with a trunk up to 1 metre through. Considered to be an ancient species from which northern rata and pohutukawa evolved. Discovered in 1975 as a small, isolated population at the northern tip of the North Island. Rātā moehau (Bartett’s rata) is critically endangered with very few adult trees remaining in forest remnant near Cape Reinga. Trees grow up to 20 metres high by 6 metres wide and have a bark similar to that of the paper-bark myrtles in Australia. They usually develop as perching plants in the canopy of the host tree. Roots are formed and eventually reach to the ground, coalescing into a single trunk which in due course replaces the host. Rata that germinate on the ground grow into trees that look different to rata that germinate high among the branches of a host tree. The trunk of an epiphytic rata consists of coalesced roots coming down from above, whereas the trunk of a terrestrial rata consists of a stem(s) that grow upwards. Although pohutukawa flowers usually occur in a range of different reds, from a pinkish crimson to brownish red, a number of colour variations have been recorded. Unusual flower colours on record include: apricot, salmon, yellow and pink! 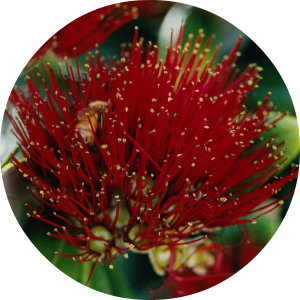 Early Maori also used the flowering of pohutukawa as a seasonal sign that kina were fat and ready to eat! 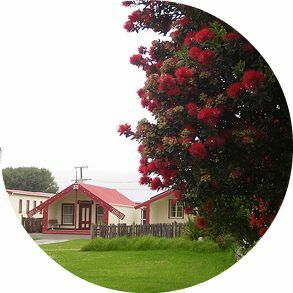 There are several different ways to distinguish between a pohutukawa and a rata tree. One is to look at the leaves. Pohutukawa leaves are generally larger and darker green than northern rata and can have slightly rolled edges. The underside of a pohutukawa leave has fine white hairs whereas the northern rata leaf is glossy on both sides. Northern rata leaves also has a small notch in the tip. 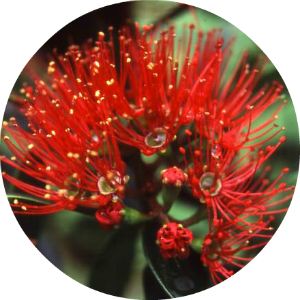 Hybridisation between pohutukawa and northern rata can make identification difficult. Hybridisation is common and populations can be found on the shores of the Rotorua lakes and on Rangitoto Island. Some hybrids have been developed by the nursery industry, ‘Mistral’ (northern rata x pohutukawa) being a good example. In the past these trees were favourites for firewood! A mature pohutukawa has a different structure to rata. Generally they are multi trunked, with spreading branches. 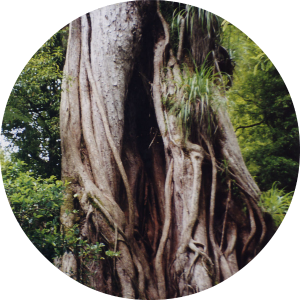 A northern rata is generally a more upright tree. A pohutukawa tree flower will have more stamen, so a denser, more prolific flowers. Northern rata has less, southern rata, less again.